Happy Holidays! My family would like to wish a blessed 2019 to everyone that has supported the special work that we continue to do through Project Coqui. You have brought joy and hope to many. In this final update of 2018, it will be more like personal short stories with lots of photos. I saved the best story for last, so please take a look. During a recent trip to Ponce, Puerto Rico, Ms. Josefina “Tata” Pacheco sat next to me at a local event. We started a conversation and Tata explained that she is a community leader in the neighborhood of Bélgica and had established LOS HIJOS DE BÉLGICA, INC., a Not-for-Profit 501(c)(3) organization to rescue a once vibrant historic cultural and musical community that had fallen on hard times. One of the goals stated is to establish a Digital Lab at a small building next to the community elementary school. The community center building that Tata is currently refurbishing was an abandoned clinic and it was my first summer employment location at age 14! Immediately, I told Tata about Project Coqui and made a commitment to help. LOS HIJOS DE BÉLGICA organized a three-day cultural, music, and health event in their community from 23 to 25 November 2018. The intent of the event in addition to the cultural aspect, was to raise funds for their Community Center. Their fundraising has been door-to-door and was $1,700 negative. My friend Dr. Yosem Companys from Liberation Technology at Stanford and I wrote a story to start a fundraising event on Giving Tuesday and reached out to friends and family. We raised $4,000! 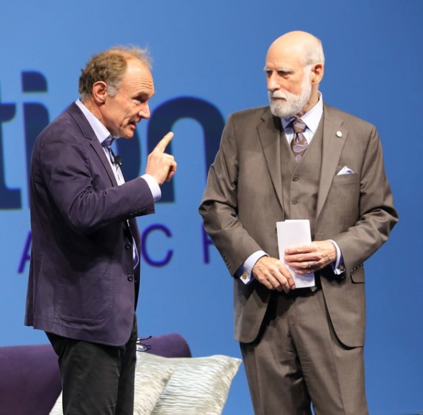 The largest donor was Vint Cerf (Father of the Internet) and the community is going to dedicate a conference room in his name. This community seeks to be vibrant to empower their students with knowledge and tools to serve their community. 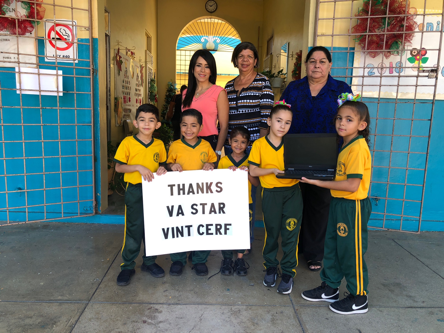 Our partnership with VA-STAR led to a donation of 12 laptops to start a Digital Lab in Bélgica, where students from the Abraham Lincoln Elementary School can do homework after classes with old-school mentorship from caring neighbors. Click the link to watch a music video! This once vibrant community had served as one of the birthplaces of Bomba y Plena -- a precursor of Reggaeton -- and the home to many future brilliant leaders and artists, including salsa superstar and adopted child Héctor Lavoe. They are focused on transmitting the community's musical traditions, rich history, and cultural legacy to its youth. 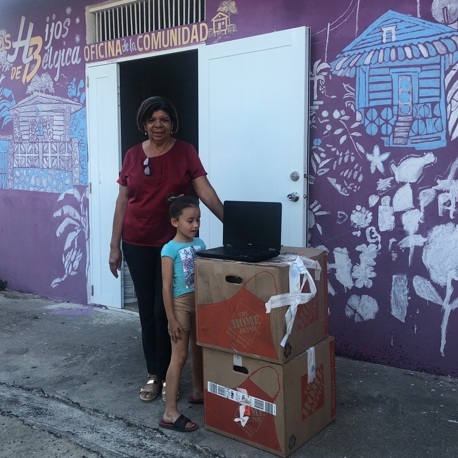 Liberation Technology at Stanford University has made a commitment to the communities of Belgica in Ponce and La Moca in Penuelas to defy limits and bring education lessons from the digital edge. Adsystech Executive Rolland Gillis (third from right on photo on the right) is going to pilot new data innovation models (self-reporting) that benefits the users at these communities, such as; health, mental sharpness, developing skills, financial benefits, etc. Visited the office of a college friend, Dr. Angel Torres in Santa Isabel. There I socialized with the patients in the lobby. A group of high school students walked-in selling Bingo tickets for their senior class fundraising, a pre-Internet approach. I bought $40 worth and shared the tickets with the patients. Two-hours later I met the group again and learned they had raised only $43. In a conversation with the gentleman on the right I learned that he did not have enough money to pay for the dental work. Unknown to him, I paid the Admin person for his dental work. Thanks to VA Star, I was able to donate a computer to Dr. Orlando Lugo, a Catholic Priest in Ponce to support community service. Dr. Lugo is the Champion behind the Hearts, Minds, and Souls problem set, which recognizes that the fabric of our society is in chaos, it has been torn; and seeks to heal it with focus on customs, culture, and traditions, by employing activities such as music, theater, film, arts, dance, social media, and training, resulting in increased employment, a more beautiful, vibrant, and safe city, with tourism, etc. Also, donated a computer to Maricelys Rodriguez, an Agricultural Engineer that teaches high school students. 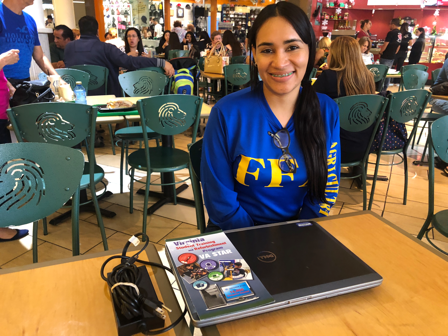 I started a conversation with Maricelys and her students at a food court in Ponce, because they were wearing T-shirts with the letters FFA, which stands for Future Farmers of America. I learned that they lack all the basic tools, which are on order, but are expected to arrive in six months. Access to computers is very limited, they have to sign-up and wait their turn. I had a computer designated for someone else, but felt this teacher could make better use and made the donation. A new and significant collaborator with Project Coqui is Dr. Edwin Melendez an Economist from Hunter College. 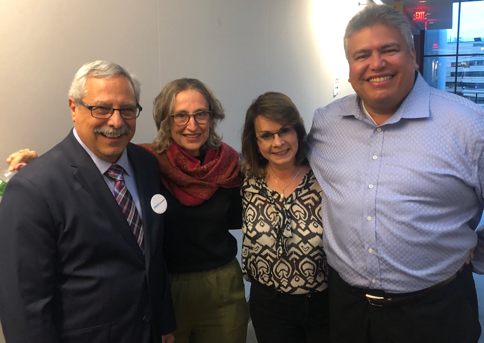 Edwin is basically the leader of the Puerto Rican diaspora in the U.S.
Project Coqui has received strong support from the Federal Government Faith-Based Initiatives Program Managers in support of needs in PR. A second visit by a large delegation was made in December to learn about the priority problem sets of four communities; Ponce, Humacao, Aguada, and Utuado. The Puerto Rico Science, Technology, and Research Trust hosted the event and has taken the lead to represent the communities and lead the federal pilot projects. Dr. Wells is a former Department of Defense Chief Information Officer and a member of the People-Centered Internet (PCI) coalition that has been a strong supporter of Project Coqui for a year. Thank you, Linton, for volunteering your expertise in addressing resilience. Meeting with old friends, Ivan and Susie, who in October of 2017 coordinated helicopter delivery of emergency medicines that helped save lives and additionally made a large cash donation. Ramon is married to my cousin Lourdes and behind the scenes, both of them have provided a lot of assistance to our team navigating numerous actions. Ramon was a former Cultural Director for the City of Ponce and retired to take care of his wife, who was diagnosed with Cancer. During my last visit, he made this donation, but the meaning is much greater, so please let me explain. Ramon started the conversation by saying that Project Coqui needs a better logo and wanted to give me “a piece of his heart”. He reached under a shelf unit behind him and presented me a masterpiece! He proceeded to explained that we had earned it for the fabulous altruistic work that we have done and continue to do tirelessly and unselfish for well-being of others. This original masterpiece is a carved and polished Coqui on a single black marble rock with fossils from Barranquitas, by a now famous sculptor. This sculptor was self-taught and fifteen years ago, had not developed the connections in the field. Every attempt to enter the field, led to nothing. One person suggested, that if there was someone in Puerto Rico that could help, was Ramon. The sculptor came to Ramon and asked how to launch his career. Ramon was so impressed by his work, that on-the-spot chartered a roadmap to hold the first exposition. Unknown to Ramon, the sculptor planned to commit suicide, if the meeting with Ramon was not positive, so basically his positive assistance saved the sculptor’s life. Ramon complemented how beautiful this Coqui sculpture was, and it was given as a gift. Now that meaningful gift has transferred to Project Coqui, because we truly represent the meaning of this piece. 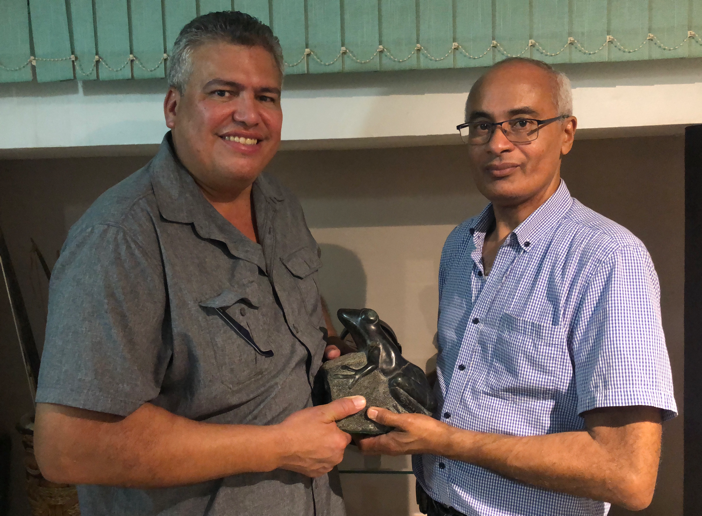 The beautiful work we are doing for the City of Ponce and the other actions being done by Project Coqui, convinced Ramon to give us a piece of my heart, because this piece is beautiful and is from a friend that he loves very much. 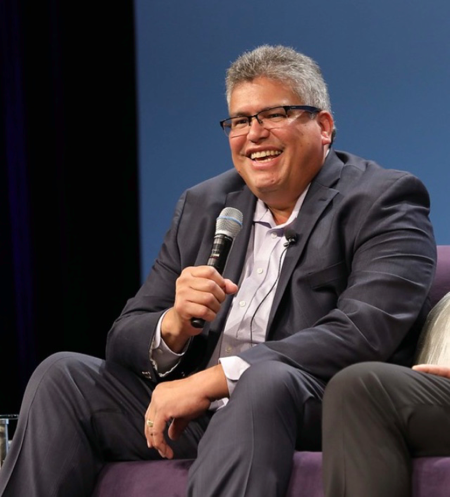 On December 10, 2018 PCI held a conference in San Jose, California, recognizing an achievement, to observe 50% of the world population being globally connected to the Internet. I was a panelist, and for your enlighten, below please find the questions anticipated and the answers I prepared. Might I suggest we begin with each of you sharing your own thoughts as to what is community resilience and why it's important? In my military days, I was taught to think safety first, then take care of our people, and finally we could be confident that the mission consistently would be achieved. In private industry, I have learned that regulated industries compartmentalize their business in three broad categories; Policy, Process and People. The first two are well understood, but people are not. In the digital world, we are in a knowledge-intense competition era. Whoever connects the dots, creates knowledge, and enables a decision cycle first, wins! Our communities need Champions, that organizes for safety, know how to take care of people in times of need, dream how to maximize community assets, leverage external resources, collect data that empower individuals, educate the marginalized, and collect metrics to monitor progress. People normally achieve what is measured. 1. What do you think are the unsolved challenges regarding the Internet and Community Resiliency? The Internet is the number one economic success in the world, it has lifted many people from poverty, has made many millionaires, and even multi-billionaires. There is unfinished work, we need CHAMPIONS to help develop new Internet models to provide access, tools, and training to the marginalized (poor, rural, disabled, elderly, and women). In Puerto Rico, we have activated the faith community, since Puerto Rico has more churches per square mile than any other nation in the world, and the central government is not trusted, basically a failed-state. In the U.S. the government collects DATA as a Case Manager, from the top down. We need new approaches to develop new data models that satisfy the needs of the government, but also empower the individual (health, mental sharpness, skills, entrepreneurship). It is critical that we collect METRICS to measure and accelerate progress (self-reporting), because people normally achieve what is measured. These action items must be led by Champions at each community in order to break “fear of freedom” (eleusterophobia), stop looking at their belly-button, lift their heads, look at the world and achieve permissionless innovation in the digital economy. We need to police the Internet better by deploying successful behavior intent models, such as; truth, deception, aggression, time to aggression, who is the leader, who is the follower, who has been radicalized, etc. 2. What do you think is the important unfinished work that needs to be done to help communities be more resilient to adverse events (caused either by nature or humans)? Empower communities and individuals to get organized, dream, and execute, do not depend on the government. Industry should establish a Digital Corps, similar to the Peace Corps by the government. Industry has a role to play, don’t leave it to the government, the government is “a machine” and it grinds. 3. What have you seen that gives you hope that we can solve some of these challenges? What can we do to inspire greater resiliency of communities and groups of people using digital technologies? On the ground in Puerto Rico, 15 trips and more than 150 days volunteering since hurricane Maria. Activated 12 local communities, three networks (fishermen, churches, Montessori schools), and one family of 9. We started by providing aid and that later transitioned to building capacity. Puerto Ricans are simple people and the number one thing they want is respect, a fair opportunity to earn a decent living, and they welcome Subject Matter Experts to help them deliver at the macro-level. It gives me hope that I am communicating with this audience and maybe, you would like to use Puerto Rico as a battleground to innovate the future of the Internet. We want hope, and if you would like to adopt a community, I will help you. •	Our competitive advantage is to learn faster and to rapidly convert this knowledge into action for economic recovery. We need game changing steps in thinking, technology, education, infrastructure, services and processes in preparing our local communities and workforce. •	Our mission is to enable communities to help themselves. The greater vision is for communities to take control of their future, learn, and show others how to ride the wave of digital transformation. This will create the next generation of Internet living-learning network of communities.